So I like bread. 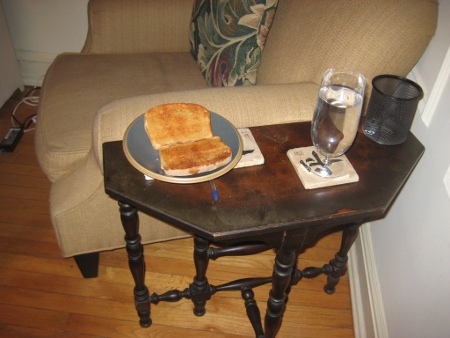 My usual breakfast involves toast. Living in London, I began to appreciate good bread and hoped to find more of it back in Chicago. This hasn’t been too difficult, which is nice. Apparently, west of us, there are a number of Jewish bakeries so the selection is pretty good. 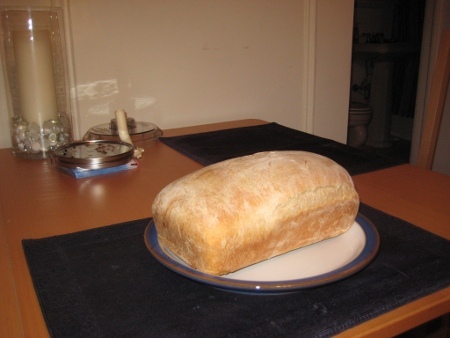 I was seriously impressed with how easy it is to make this simple loaf of bread. Granted, I had the help of a food processor to mix it up nicely. But even if you did it by hand, you’d likely only need about 30 minutes of work. The rest is waiting for the dough to rise and the ingredients list is simple and most of it keeps forever. You can even make a whole lot of dough and freeze it and take it out in advance to rise. So how did it taste? Well, I honestly think it tasted better than most store-bought bread. I used a basic recipe from How To Cook Everything, so it’s not like I was breaking new ground. And, putting it in a simple plastic bag, it almost seems to keep longer than some of the stuff I’ve bought from bakeries. Even better, unlike going into a Subway which smells like bread baked in hell, fresh baked bread smelled lovely! This entry was posted on Sunday, January 23rd, 2011 at 9:22 am	and is filed under Chicago, Photos. You can follow any responses to this entry through the RSS 2.0 feed. Both comments and pings are currently closed. I confess…I’m impressed. Remember when I was on a homemade bagel kick and they came out like little hockey pucks? Looked terrible but toasted great! wahey! nice one, baker dude. you’re so right- there’s nothing like the smell (or taste) of a fresh loaf (not that kind). btw, it’s about 0 degrees C here and we are freezing our butts off. Entries (RSS) and Comments (RSS).22 queries. 0.277 seconds.